WHAT IS THE STEM SCHOLAR PROGRAM? 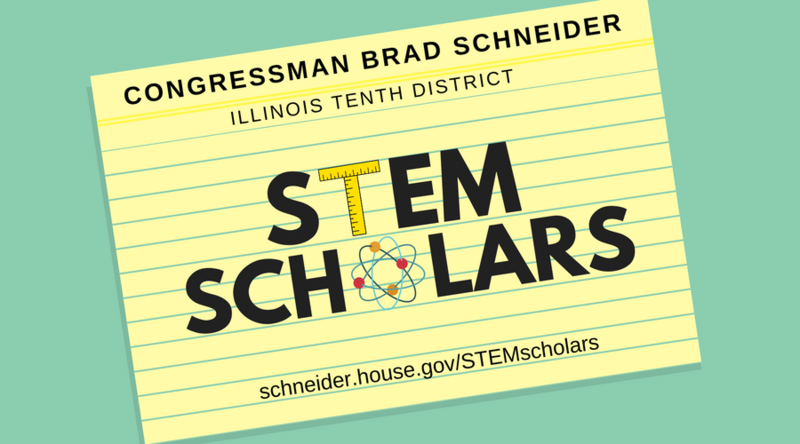 The Illinois Tenth Congressional District STEM Scholar Program is an exciting new educational opportunity launched by Congressman Brad Schneider for high school students in our community. The program aims to connect highly-motivated students interested in science, technology, engineering, and mathematics with hands-on learning experiences throughout our district. Beginning this fall, students selected to participate in the STEM Scholars program will have the opportunity to join Congressman Schneider on visits to four STEM-related businesses and facilities during the 2018-2019 school year. On these visits, students will have the chance to participate in discussions with local employees, business owners, and educators, and learn more about the STEM career opportunities in our backyard. WHO CAN BE A STEM SCHOLAR? This program is open to all rising Sophomores and Juniors who live in or attend high schools located within Illinois’s Tenth Congressional District. Due to space constraints, we will only be selecting two applicants from each high school for participation in this competitive program. You will need the following items to apply for the STEM Scholar Program. Please assemble these materials and write your essays before submitting via the Google Form before Friday, June 29, 2018. QUESTIONS ABOUT THE STEM SCHOLAR PROGRAM? Please contact our Lincolnshire Office at (847) 383-4870.